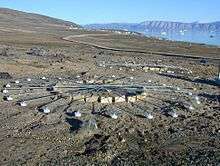 Infrasound arrays at infrasound monitoring station in Qaanaaq, Greenland. Infrasound, sometimes referred to as low-frequency sound, is sound that is lower in frequency than 20 Hz (hertz) or cycles per second, the "normal" limit of human hearing. Hearing becomes gradually less sensitive as frequency decreases, so for humans to perceive infrasound, the sound pressure must be sufficiently high. The ear is the primary organ for sensing infrasound, but at higher intensities it is possible to feel infrasound vibrations in various parts of the body. The study of such sound waves is sometimes referred to as infrasonics, covering sounds beneath 20 Hz down to 0.1Hz and rarely to 0.001 Hz. This frequency range is utilized for monitoring earthquakes, charting rock and petroleum formations below the earth, and also in ballistocardiography and seismocardiography to study the mechanics of the heart. Infrasound is characterized by an ability to cover long distances and get around obstacles with little dissipation. In music, low-frequency sounds, including near-infrasound, can be produced using acoustic waveguide methods, such as a large pipe organ or, for reproduction, exotic loudspeaker designs such as transmission line, rotary woofer, or traditional subwoofer designs. Subwoofers designed to produce infrasound are capable of sound reproduction an octave or more below that of most commercially available subwoofers, and are often about 10 times the size. Infrasound was used by the Allies of World War I to locate artillery. One of the pioneers in infrasonic research was French scientist Vladimir Gavreau. His interest in infrasonic waves first came about in his laboratory during the 1960s, when he and his laboratory assistants experienced shaking laboratory equipment and pain in the eardrums, but no audible sound was picked up on his microphones. He concluded it was infrasound caused by a large fan and duct system, and soon got to work preparing tests in the laboratories. One of his experiments was an infrasonic whistle, an oversized organ pipe. Infrasound is defined by the American National Standards Institute as "sound at frequencies less than 20 Hz." 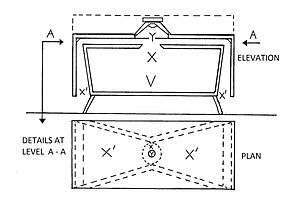 Patent for a double bass reflex loudspeaker enclosure design intended to produce infrasonic frequencies ranging from 5 to 25 hertz, of which traditional subwoofer designs are not readily capable. Natural events: infrasonic sound sometimes results naturally from severe weather, surf, lee waves, avalanches, earthquakes, volcanoes, bolides, waterfalls, calving of icebergs, aurorae, meteors, lightning and upper-atmospheric lightning. Nonlinear ocean wave interactions in ocean storms produce pervasive infrasound vibrations around 0.2 Hz, known as microbaroms. According to the Infrasonics Program at NOAA, infrasonic arrays can be used to locate avalanches in the Rocky Mountains, and to detect tornadoes on the high plains several minutes before they touch down. Animal communication: whales, elephants, hippopotamuses, rhinoceros, giraffes, okapi, and alligators are known to use infrasound to communicate over distances—up to hundreds of miles in the case of whales. In particular, the Sumatran Rhinoceros has been shown to produce sounds with frequencies as low as 3 Hz which have similarities with the song of the humpback whale. The roar of the tiger contains infrasound of 18 Hz and lower, and the purr of felines is reported to cover a range of 20 to 50 Hz. It has also been suggested that migrating birds use naturally generated infrasound, from sources such as turbulent airflow over mountain ranges, as a navigational aid. Infrasound also may be used for long-distance communication, especially well documented in baleen whales (see Whale vocalization), and African elephants. The frequency of baleen whale sounds can range from 10 Hz to 31 kHz, and that of elephant calls from 15 Hz to 35 Hz. Both can be extremely loud (around 117 dB), allowing communication for many kilometres, with a possible maximum range of around 10 km (6 mi) for elephants, and potentially hundreds or thousands of kilometers for some whales. Elephants also produce infrasound waves that travel through solid ground and are sensed by other herds using their feet, although they may be separated by hundreds of kilometres. These calls may be used to coordinate the movement of herds and allow mating elephants to find each other. 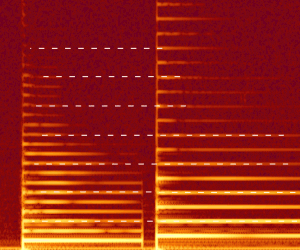 Human singers: some vocalists, including Tim Storms, can produce notes in the infrasound range. Human created sources: infrasound can be generated by human processes such as sonic booms and explosions (both chemical and nuclear), or by machinery such as diesel engines, wind turbines and specially designed mechanical transducers (industrial vibration tables). Certain specialized loudspeaker designs are also able to reproduce extremely low frequencies; these include large-scale rotary woofer models of subwoofer loudspeaker, as well as large horn loaded, bass reflex, sealed and transmission line loudspeakers. Animals have been known to perceive the infrasonic waves going through the earth by natural disasters and can use these as an early warning. A recent example of this is the 2004 Indian Ocean earthquake and tsunami. Animals were reported to flee the area hours before the actual tsunami hit the shores of Asia. It is not known for sure that this is the cause; some have suggested that it may have been the influence of electromagnetic waves, and not of infrasonic waves, that prompted these animals to flee. Research in 2013 by Jon Hagstrum of the US Geological Survey suggests that homing pigeons use low-frequency infrasound to navigate. 20 Hz is considered the normal low-frequency limit of human hearing. When pure sine waves are reproduced under ideal conditions and at very high volume, a human listener will be able to identify tones as low as 12 Hz. Below 10 Hz it is possible to perceive the single cycles of the sound, along with a sensation of pressure at the eardrums. The dynamic range of the auditory system decreases with decreasing frequency. This compression can be seen in the equal-loudness-level contours, and it implies that a slight increase in level can change the perceived loudness from barely audible to loud. Combined with the natural spread in thresholds within a population, its effect may be that a very low-frequency sound which is inaudible to some people may be loud to others. One study has suggested that infrasound may cause feelings of awe or fear in humans. It has also been suggested that since it is not consciously perceived, it may make people feel vaguely that odd or supernatural events are taking place. A scientist working at Sydney University's Auditory Neuroscience Laboratory reports growing evidence that infrasound may affect some people's nervous system by stimulating the vestibular system, and this has shown in animal models an effect similar to sea sickness. In a study of 45 people, Tehran University researchers stated: “Despite all the good benefits of wind turbines ... this technology has health risks for all those exposed to its sound” — in particular, sleep disorder. In another study at Ibaraki University in Japan, researchers said the EEG tests showed the brain function showed that the infrasound produced by wind turbines was “considered to be an annoyance to the technicians who work in close to a modern large-scale wind turbine”. On 31 May 2003 a group of UK researchers held a mass experiment, where they exposed some 700 people to music laced with soft 17 Hz sine waves played at a level described as "near the edge of hearing", produced by an extra-long-stroke subwoofer mounted two-thirds of the way from the end of a seven-meter-long plastic sewer pipe. The experimental concert (entitled Infrasonic) took place in the Purcell Room over the course of two performances, each consisting of four musical pieces. Two of the pieces in each concert had 17 Hz tones played underneath. In the second concert, the pieces that were to carry a 17 Hz undertone were swapped so that test results would not focus on any specific musical piece. The participants were not told which pieces included the low-level 17 Hz near-infrasonic tone. The presence of the tone resulted in a significant number (22%) of respondents reporting anxiety, uneasiness, extreme sorrow, nervous feelings of revulsion or fear, chills down the spine, and feelings of pressure on the chest. In presenting the evidence to the British Association for the Advancement of Science, Professor Richard Wiseman said "These results suggest that low frequency sound can cause people to have unusual experiences even though they cannot consciously detect infrasound. Some scientists have suggested that this level of sound may be present at some allegedly haunted sites and so cause people to have odd sensations that they attribute to a ghost—our findings support these ideas." Psychologist Richard Wiseman of the University of Hertfordshire suggests that the odd sensations that people attribute to ghosts may be caused by infrasonic vibrations. Vic Tandy, experimental officer and part-time lecturer in the school of international studies and law at Coventry University, along with Dr. Tony Lawrence of the University's psychology department, wrote in 1998 a paper called "Ghosts in the Machine" for the Journal of the Society for Psychical Research. Their research suggested that an infrasonic signal of 19 Hz might be responsible for some ghost sightings. Tandy was working late one night alone in a supposedly haunted laboratory at Warwick, when he felt very anxious and could detect a grey blob out of the corner of his eye. When Tandy turned to face the grey blob, there was nothing. The following day, Tandy was working on his fencing foil, with the handle held in a vice. Although there was nothing touching it, the blade started to vibrate wildly. Further investigation led Tandy to discover that the extractor fan in the lab was emitting a frequency of 18.98 Hz, very close to the resonant frequency of the eye given as 18 Hz by NASA. This, Tandy conjectured, was why he had seen a ghostly figure—it was, he believed, an optical illusion caused by his eyeballs resonating. The room was exactly half a wavelength in length, and the desk was in the centre, thus causing a standing wave which caused the vibration of the foil. Tandy investigated this phenomenon further and wrote a paper entitled The Ghost in the Machine. He carried out a number of investigations at various sites believed to be haunted, including the basement of the Tourist Information Bureau next to Coventry Cathedral and Edinburgh Castle. NASA Langley has designed and developed an infrasonic detection system that can be used to make useful infrasound measurements at a location where it was not possible previously. The system comprises an electret condenser microphone PCB Model 377M06, having a 3-inch membrane diameter, and a small, compact windscreen. Electret-based technology offers the lowest possible background noise, because Johnson noise generated in the supporting electronics (preamplifier) is minimized. The microphone features a high membrane compliance with a large backchamber volume, a prepolarized backplane and a high impedance preamplifier located inside the backchamber. The windscreen, based on the high transmission coefficient of infrasound through matter, is made of a material having a low acoustic impedance and has a sufficiently thick wall to ensure structural stability. Close-cell polyurethane foam has been found to serve the purpose well. In the proposed test, test parameters will be sensitivity, background noise, signal fidelity (harmonic distortion), and temporal stability. The microphone design differs from that of a conventional audio system in that the peculiar features of infrasound are taken into account. First, infrasound propagates over vast distances through the Earth's atmosphere as a result of very low atmospheric absorption and of refractive ducting that enables propagation by way of multiple bounces between the Earth's surface and the stratosphere. A second property that has received little attention is the great penetration capability of infrasound through solid matter – a property utilized in the design and fabrication of the system windscreens. Thus the system fulfills several instrumentation requirements advantageous to the application of acoustics: (1) a low-frequency microphone with especially low background noise, which enables detection of low-level signals within a low-frequency passband; (2) a small, compact windscreen that permits (3) rapid deployment of a microphone array in the field. The system also features a data acquisition system that permits real time detection, bearing, and signature of a low-frequency source. The Comprehensive Nuclear-Test-Ban Treaty Organization Preparatory Commission uses infrasound as one of its monitoring technologies, along with seismic, hydroacoustic, and atmospheric radionuclide monitoring. The loudest infrasound recorded to date by the monitoring system was generated by the 2013 Chelyabinsk meteor. ↑ Wired Article, The Sound of Silence by John Geirland. 2006. ↑ Garces, M.; Hetzer C.; Merrifield M.; Willis M.; Aucan J. (2003). "Observations of surf infrasound in Hawai'i". Geophysical Research Letters. 30 (24): 2264. Bibcode:2003GeoRL..30xOCE5G. doi:10.1029/2003GL018614. Retrieved 15 December 2007. Comparison of ocean buoy measurements with infrasonic array data collected during the epic winter of 2002–2003 shows a clear relationship between breaking ocean wave height and infrasonic signal levels. ↑ Garces, M.; Willis, M. (2006). "Modeling and Characterization of Microbarom Signals in the Pacific". Retrieved 24 November 2007. Naturally occurring sources of infrasound include (but are not limited to) severe weather, volcanoes, bolides, earthquakes, mountain waves, surf, and, the focus of this research, nonlinear ocean wave interactions. ↑ Haak, Hein (1 September 2006). "Probing the Atmosphere with Infrasound : Infrasound as a tool" (PDF). CTBT: Synergies with Science, 1996–2006 and Beyond. Preparatory Commission for the Comprehensive Nuclear-Test-Ban Treaty Organization. Archived from the original (PDF) on 2 July 2007. Retrieved 24 November 2007. ↑ "Microbaroms". Infrasonic Signals. University of Alaska Fairbanks, Geophysical Institute, Infrasound Research Group. Retrieved 22 November 2007. The ubiquitous five-second-period infrasonic signals called "microbaroms", which are generated by standing sea waves in marine storms, are the cause of the low-level natural-infrasound background in the passband from 0.02 to 10 Hz. ↑ "NOAA ESRL Infrasonics Program". Retrieved 10 April 2012. ↑ Payne, Katharine B.; Langbauer, William R.; Thomas, Elizabeth M. (1986). "Infrasonic calls of the Asian elephant (Elephas maximus)". Behavioral Ecology and Sociobiology. 18 (4): 297–301. doi:10.1007/BF00300007. ↑ Barklow, William E. (2004). "Low‐frequency sounds and amphibious communication in Hippopotamus amphibious". Journal of the Acoustical Society of America. 115 (5): 2555–2555. doi:10.1121/1.4783854. ↑ Von Muggenthaler, E., Perera, D. (2002), The cat's purr: a healing mechanism?, In review, presented 142nd Acoustical Society of America International Conference, 2001. ↑ Langbauer, W.R.; Payne, K.B. ; Charif, R.A.; Rapaport, L.; Osborn, F. (1991). "African elephants respond to distant playbacks of low-frequency conspecific calls" (PDF). The Journal of Experimental Biology. 157 (1): 35–46. Retrieved 27 May 2009. ↑ Larom, D.; Garstang, M.; Payne, K.; Raspet, R.; Lindeque, M. (1997). "The influence of surface atmospheric conditions on the range and area reached by animal vocalizations" (PDF). The Journal of Experimental Biology. 200 (3): 421–431. Retrieved 27 May 2009. ↑ Hsu, Christine (24 August 2012). "Man With World's Deepest Voice Hits Notes That Only Elephants Can Hear". Medical Daily. Retrieved 2 August 2016. American singer Tim Storms who also has the world's widest vocal range can reach notes as low as G-7 (0.189Hz) [...] so low that even Storms himself cannot hear it. ↑ Chen, C.H., ed. (2007). Signal and Image Processing for Remote Sensing. Boca Raton: CRC. p. 33. ISBN 0-8493-5091-3. ↑ Nature. Can Animals Predict Disaster? – PBS: posted November 2005. ↑ Olson, Harry F. (1967). Music, Physics and Engineering. Dover Publications. p. 249. ISBN 0-486-21769-8. 1 2 "Infrasound linked to spooky effects". MSNBC. 7 September 2007. Retrieved 27 January 2010. ↑ "Effect of Wind Turbine Noise on Workers' Sleep Disorder: A Case Study of Manjil Wind Farm in Northern Iran". Tehran University of Medical Sciences. Retrieved 29 April 2015. 1 2 Sounds like terror in the air Sydney Morning Herald, 9 September 2003. ↑ Tandy, V.; Lawrence, T. (April 1998). "The ghost in the machine." (PDF). Journal of the Society for Psychical Research. 62 (851): 360–364. ↑ Tandy, V. (July 2000). "Something in the cellar." (PDF). Journal of the Society for Psychical Research. 64.3 (860). Archived from the original (PDF) on 2011-09-29. ↑ Arnot, Chris (11 July 2000). "Ghost buster". The Guardian. London. Retrieved 5 May 2010. 1 2 Development and installation of an infrasonic wake vortex detection system By Qamar A. Shams and Allan J. Zuckerwar, NASA Langley Research Center, Hampton VA USA, WakeNet-Europe 2014, Bretigny, France. ↑ Paul Harper (20 February 2013). "Meteor explosion largest infrasound recorded". The New Zealand Herald. APN Holdings NZ. Retrieved 31 March 2013. Gundersen, P. Erik. The Handy Physics Answer Book. Visible Ink Press, 2003. Chedd, Graham. Sound; From Communications to Noise Pollution. Doubleday & Company, 1970. O'Keefe, Ciaran, and Sarah Angliss. The Subjective Effects of Infrasound in a Live Concert Setting. CIM04: Conference on Interdisciplinary Musicology. Graz, Austria: Graz UP, 2004. 132–133.